My homily this morning at Divine Infant Parish in Orleans, Ontario on the Memorial of St. John Vianney. 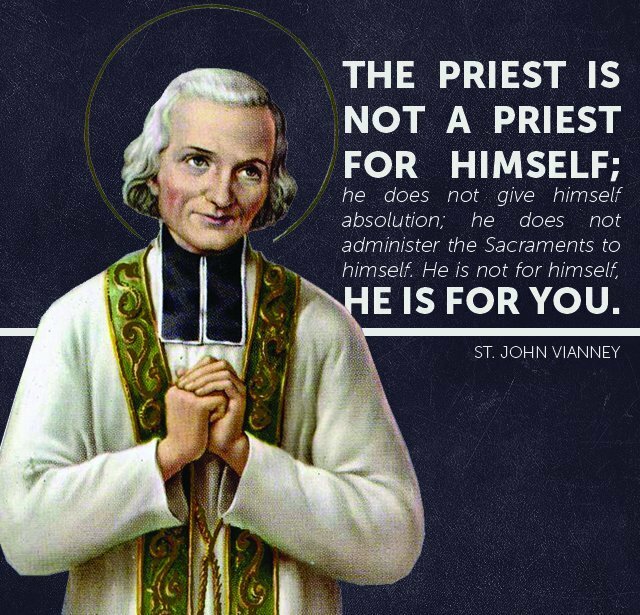 Today is the Memorial of St. John Vianney, the patron Saint of parish priests. This holy priest, the Curé d’ Ars, had such zeal for God that he ignited a religious revival in the small town of Ars, located in France, where he was assigned at a young age of 31 as pastor of the local church in a village of about 200 residents. The people in this very small village were essentially ignorant or indifferent about their faith. They are said to have had 4 bars where many of the men would squander their wages. The town was known for its wild parties and dances. St. Vianney would spend hours in prayer lying prostrate before the altar in his small church, begging God to change the hearts of the people. He offered to sacrifice his life for his people, to suffer for them, and to do extreme penance and fasting for their conversion. He is said to have lived for years on a single daily meal of boiled potatoes, offered for the conversion of the souls of his people. His sacrifices were rewarded by God as many in the town experienced conversion due to his example of holiness. He was particularly called to hear confessions, as his gift of calling people to repentance was especially powerful. He became a much sought-after confessor, hearing the confessions of up to eighty thousand pilgrims each year. St. John Vianney spent up to 18 hours a day in the confessional and remained in Ars for 41 years as the pastor of the village. During this time God used St. Vianney to help many young people discern their vocations and heal many others of their physical ailments. He died 159 years ago at the age of 73 on August 4, 1859. He was canonized in 1925. The Handmaids of the Precious Blood is a community of cloistered contemplative nuns in East Tennessee who offer their lives for the sanctification of priests. I happen to be their Communications Director and through the time I’ve been with them I’ve come to better understand how important it is that we pray for our priests and support them in their vocation. Our priests are charged with the spiritual welfare of their community and they are called, as we all are, to be faithful to the teachings of Mother Church, teachings which are counter-cultural. They must speak God’s word like Jeremiah in today’s first reading and John the Baptist in today’s gospel, and they are often met with vitriol when they do so. Their words are generally disregarded in our secular culture, and sometimes even within our parish communities. For example, in light of last week’s celebration of the 50th Anniversary of Humane Vitae we should all reflect on the fact that nearly 90% of Catholics in the United States do not accept the Church’s teaching on the use of artificial contraception. I’m not sure what the statistics are in Canada, but I suspect they’re comparable. It can certainly be challenging for a priest to proclaim Church teaching on an intrinsically evil practice when the vast majority of his parishioners consider it to be acceptable. Let each of us today vow to encourage and support our priests, and do our best to take their teachings to heart. Most importantly, let us resolve to pray for them each and every day. I’d like to encourage you to take some time this weekend to learn more about the ministry of my employer at their website, nunsforpriests.org. You’ll find a great deal of information there about practical ways we can support our priests. In fact, you can even spiritually adopt a priest and we can all become a prayer warriors for our priests. Always remember and be grateful for the fact that our priests offer their lives for us so that we have access to the sacraments. Without our priests there would be no Eucharist and without the Eucharist, there would be no Church. We would also be without the Sacraments of Reconciliation and the Anointing of the Sick without our priests. Can you imagine life without them? I can’t. I’ve often heard it said that one of the best things we can do for our priests is to go to confession regularly. You are so blessed here at Divine Infant to have this sacrament available before daily Mass each morning. We have the same privilege at my parish in Tennessee, as well as every Sunday before each Mass. So many parishes in the States make it challenging to attend confession, offering it only on a limited schedule or by appointment. Take advantage of this privilege and attend confession frequently, as it will help so much in your spiritual growth. While I don’t think Father has plans to spend 18 hours a day in the confessional like St. John Vianney did, I’m sure he is very pleased to hear your confessions frequently and to offer absolution for your sins. I can say with certainty that he would love to have you come regularly to receive this powerful sacrament of healing and forgiveness. I now invite you to pray with me the Daily Prayer for A Priest that is prayed by the Handmaids before the Blessed Sacrament and is available on their website. You might consider adding this prayer to your daily devotions. Grant, Father, the grace to seek for no greater joy than your love and the privilege of bringing it to others. Grant to me, an ever-deepening reverence of your priesthood. And when death ends my life here on earth, may you, the Eternal High Priest, reveal to me in the Beatific Vision the consolation everlasting of having prayed and sacrificed for your priests here on earth. Amen. This homily was very much needed. Thank you.